After days of debate and years of dreaming, collaboration and study, the resolution called “Optimal Team Practice” (OTP) came up for a vote in the American Academy of PAs (AAPA) House of Delegates (HOD). I remember hearing the Speaker call for all votes in favor and although there was a good response, I couldn’t tell if it was a majority. Then, the Speaker called for “all opposed” and there was silence. Pure, beautiful, silence. It was in that moment that an entire profession embraced their future. In years past, a determined and legendary PA leader, David Mittman, started saying we needed Full Practice Authority/Responsibility in order for the PA profession to survive and thrive. Many PAs did not want to risk future PA legislation by angering physicians with FPA. We saw the fierce battles the NPs had to engage in and realized that we would have to fight the state Board of Medicine in almost every state without the same level of protection that comes from having your own state board (like nursing). As the years went on, we saw our nurse colleagues fight battle after battle, state after state, and even though the physician groups bemoaned their success, they didn’t cease to hire NPs. In the past year, it became clear that physician groups were actually preferentially hiring NPs due to the reduced administrative burden, over “dependent” practitioners like PAs. PAs who felt that physicians would continue to hire them due to PAs practicing in the same “medical model” or staying “in our place” were sadly mistaken. As physicians had increasingly become employees instead of solo practitioners, they no longer wanted the professional liability that comes from having to “supervise” another professional. 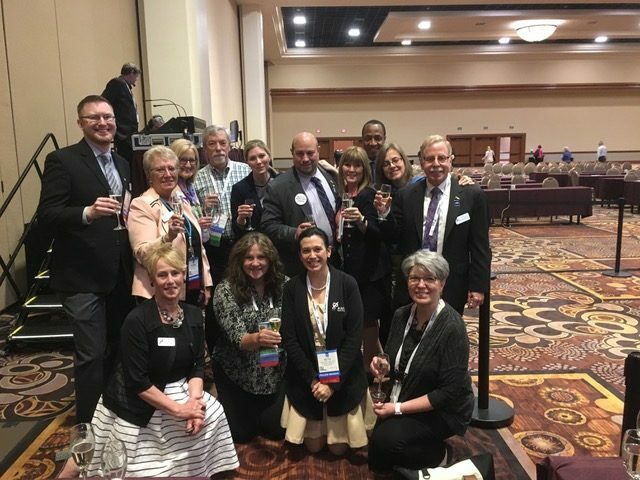 Almost two years ago, I led an advocacy team for primary care PAs (AFPPA) joining with the PAs for Tomorrow (PAFT) and Brian Sady (a passionate educator from Nevada who wrote a comprehensive white paper on FPA for PAs) to address PA practice authority. We worked diligently to create a resolution to bring to the 2016 AAPA HOD to introduce Full Practice Responsibility (FPR). There was vigorous debate on the house floor but ultimately the resolution was referred for further study. From this point, the HOD and AAPA Board of Directors (BOD) formed the Joint Task Force on the Future of PA Practice Authority (JTF). The JTF reflected the diversity found in our profession. It was made up of clinically practicing PAs, educators, state PA leaders, and two PAs who work for the Veterans Administration. It was a group that would have to come to consensus on ideas and language that would be best for our patients, our profession, and our stakeholders. Emphasize the PA profession’s continued commitment to team-based practice. Support the elimination of provisions in laws and regulations that require a PA to have and/or report a supervisory, collaborating, or other specific relationship with a physician in order to practice. Advocate for the establishment of autonomous state boards, with a voting membership comprised of a majority of PAs, to license, regulate, and discipline PAs. Ensure that PAs are eligible to be reimbursed directly by public and private insurance. A survey was released on FPAR with over 12,000 PAs responding and over 71% in favor of the concept. The AAPA held calls with state chapters, specialty organizations, students, program directors, PA Administrators, past presidents and a variety of other PA leaders, as well as external stakeholders to field questions and explain the concept of FPAR. The AAPA also received thousands of emails, comments on social media, and letters regarding FPAR. PA leaders met with multiple physician organizations to discuss the proposal under consideration. By March, it appeared clear that this would be the way forward, but slow deliberation is the hallmark of PA leadership. During the Leadership and Advocacy Summit held in March 2017, we heard concerns from some attendees, including PA educators, which led to rethinking the name and some of the language originally proposed by the task force. As the pillars would directly impact AAPA’s Model State Legislation, they were added to the guidelines document as opposed to creating a “stand alone” resolution. The pillars were given a new name — “Optimal Team Practice” (OTP). This change in language gave some assurance to PAs that felt teamwork was important to emphasize. They wanted it to be clear that PAs weren’t going “rogue”, but rather wanted to be better teammates by not burdening any other teammate with “supervision”. So, once again, I found myself on the floor of the HOD last week, asking for my colleagues to consider the future of our profession and the impact OTP would have on patient access to care. And after two days of debate, it ended in silence… followed by cheers, tears, and emotion unlike anything I’ve ever seen from our profession. It was a moment that changed everything – how PAs see themselves as a profession, where we belong in the healthcare landscape, and how we can expand access to care for our patients. Beth Smolko is a certified PA with experience in primary care and occupational health and wellness. While in PA school, Beth volunteered in a mobile medical unit in Tucson, AZ which ignited her passion for bringing quality medical care to the underserved outside the walls of a clinic. Beth is a recognized leader in primary care with professional roles that include: Director-at-Large, American Academy of PAs (AAPA); Past President of the Association of Family Practice Physician Assistants (AFPPA); PA Representative at the 2013 and 2014 World Hepatitis Day meetings held at the White House; HCV Testing Recommendations Implementation Panel – Healthcare Providers (Centers for Disease Control). Participant representing PAs in the discussion on the Implementation of Hepatitis C Screening Recommendations for Patients born between 1945-65; Preceptor for George Washington University, Franklin Pierce and Salus University PA Programs. Preceptor for LECOM. Preceptor for University of Michigan Nurse Practitioner program; Guest lecturer for Mary Baldwin – Murphy Deming and George Washington University PA program speaking on “Pulmonary Disease” and “Family Medicine”; President and Founder of The Heart of Medicine, a non-profit connecting healthcare providers with patients desperately in need of care in Haiti. Thank you so very much for all of your hard work, passion, determination and time. This is a huge undertaking and one that must be done. We are finding ourselves, as PA-Cs, with fewer opportunities as employees in private practices across the USA. We are finding that these private practices want to hire us as independent contractors, thereby benefiting from the fact that they do not have to pay any type of benefit, health insurance, retirement, etc., as well as any worker’s comp on we PAs. Though I do not mind this, we do not have the write offs that the MD or medical practice does, and we end up paying minimum alternative tax along with our yearly taxes, while having no benefits what so ever. As PAs, these private practices dictate where and when we work, as well as our patient schedules, etc., which is a grey area when it comes to the actual definition of an independent contractor vs. employee. These private practices want to hire us, want us to work just as the MDs that they hire, but we are not paid nearly what the MDs are, and we have very little say in what we do, as the supervising MDs or office management determine our professional involvement within the private practice. I see this as a positive thing, for someone like myself that has been working autonomously for many years. I also feel that it is important for any PA to work as an employee if that feels right, as this is equally beneficial. However, in situations where we are made to be 1099, we deserve to have the practice authority for which we are seeing patients. I sincerely appreciate all of the work you have all done, as we need to remain competitive with the NP branch of midlevels as well. Given our education model, there is no reason that we should not enjoy the same benefits of our professional degree as that of the NPs. Well done!! Reading your blog took me right back to that magical moment in the HOD when our profession spoke with one voice and unequivocally stated that we “are responsible!” Responsible for our individual decisions in patient care; responsible for regulating ourselves; responsible to plot our own course as a profession and no longer exist in the shadows of another. PAs everywhere owe a great deal of thanks to you, Dave Mittman, Jeff Katz, Brian Sady, and many others who have worked tirelessly to see this to fruition. Now the real work must begin in earnest. I am so excited to work as a PA leader during this amazing time and look forward to partnering with you to make OTP the way of the future! Thanks Beth and all who made this day possible!! From a future PA, thank you so very much. Very exciting. I just moved from one state to one where I’d practiced before and the rigmarole to get started was amazingly complicated. I did more paperwork and paid more fees and had my sup doc sign so much. I’m working with two NPs who did relatively little to switch jobs and I’m actually the one they go to for their questions, not the doc. Anything to make this all easier and more representative of the work we do! Thank you! A great big thank you to all of you tireless leaders of our profession who have worked so hard on our behalf. I hope and pray that your vision becomes our reality! Thank you for sharing these insights that culminated in that historic vote for the PA profession! Great article Beth. It was hard work, but I really enjoyed working with all of you. Friendships were forged, and the future looks bright. I still remember calling Dave, Michael Doll, and many other PAs 2 years ago to talk about and rally behind the cause. What an amazing journey. What an amazing moment on the Hod floor. I was choked up and tearful. I’m still in shock. And on our 50th anniversary in my backyard of Vegas of all places. Reading your re-account takes me right back to the room. The electricity. The purest, rawest feeling I had cannot be put into words. I am so happy I was able to be there. A part of history. Seeing, talking to our leaders, such as yourself, all in the fight together. My deepest gratitude for the hard won achievements and advances that have been wrought thus far…Looks like our direction is set… we must continue onward and upward…You can count on my contributions on this journey…with hopes it is done so in time.